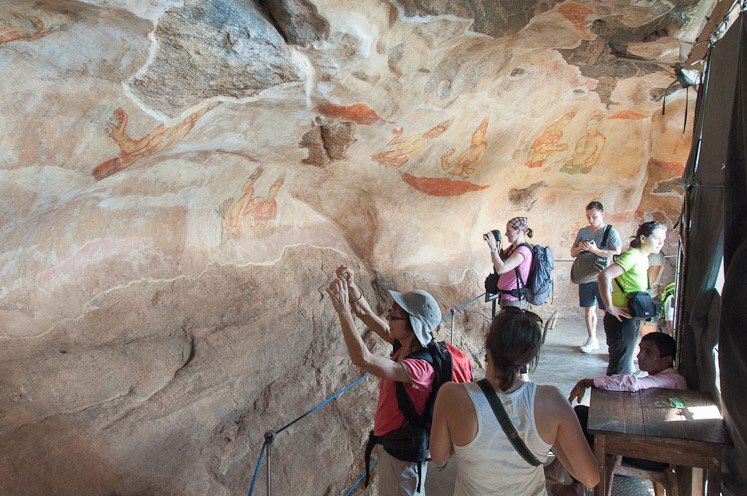 Sigiriya is the premier site and the most important place of the Cultural Triangle in Sri Lanka. We had heard about this Sigiriya throughout our whole trip around Sri Lanka, and all the taxi drivers asked us if we wanted to go to Sigiriya. So we were a bit fed up with this rock even before we had seen it, thinking “how fab can a huge rock be?!”. We actually didn`t plan to go to Sigiriya at all, but on our way to the Ancient City Polonnaruwa, our driver kind of pushed us to stop at Sigiriya to climb the Lion Rock. And we don`t regret it; WOW! What a rock! And what a great climb and amazing view from the top! 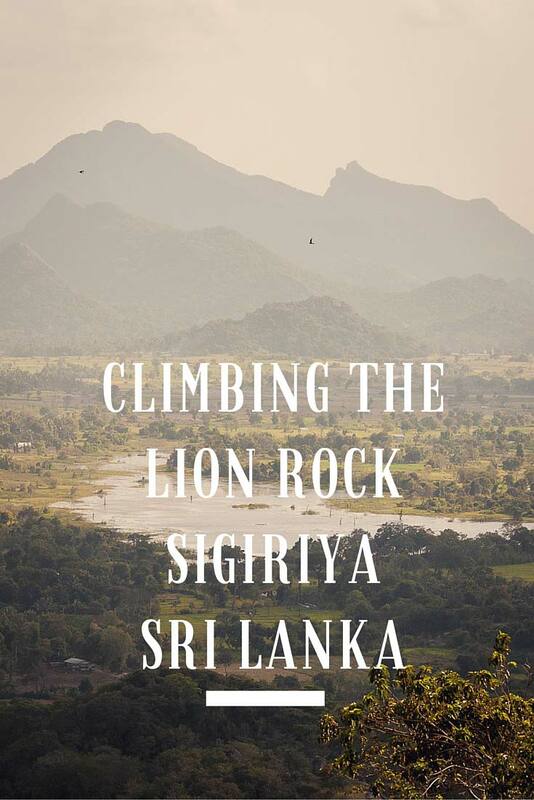 The Lion Rock – Sigiriya has a really special shape, is nearly 200 meters high, and rises mysteriously from the jungle. The rock satisfies both adrenaline freaks, the history buffs, art people and those who are looking for a great view. Whatever attitude you bring to the rock, you won`t be disappointed! 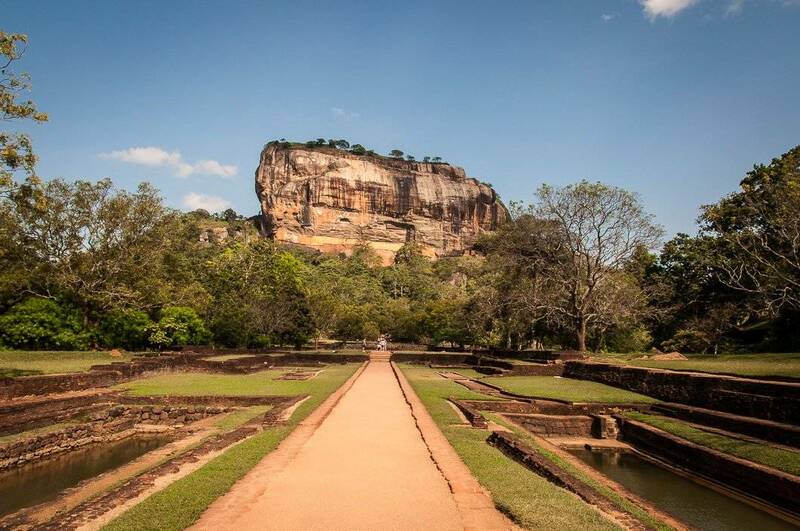 Sigiriya was declared a Unesco World Heritage Site in 1982. All the natural cave shelters and rock overhangs throughout the rock were inhabited in prehistoric times. 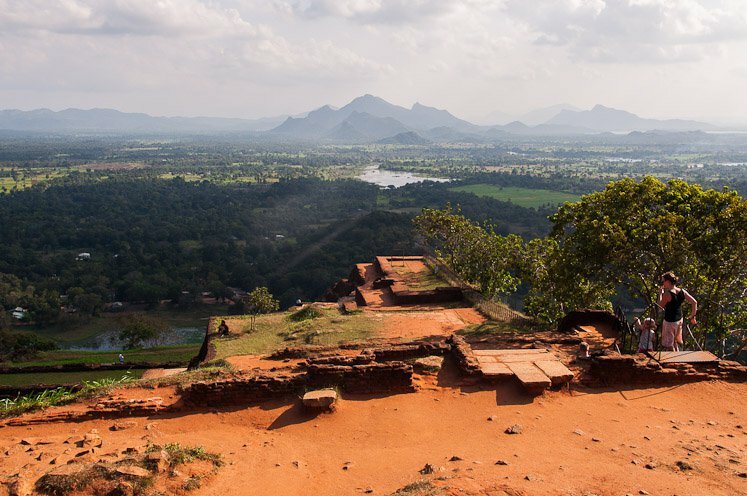 A myth says that King Kassapa (AD 477-495) chose Sigiriya to be the capital of Sri Lanka, and built a garden and an unassailable palace on top of the rock, after killing his father King Dhatusena. The capital and the royal palace were abandoned after the king’s death, and was used as a Buddhist monastery until the 14th century. Surrounding the Lion Rock is the beautiful royal gardens, including water gardens, boulder gardens and terraced gardens. It`s a lovely place to sit and listen to the songs of birds and gentle gurgle of water. Funny signs on the way up. 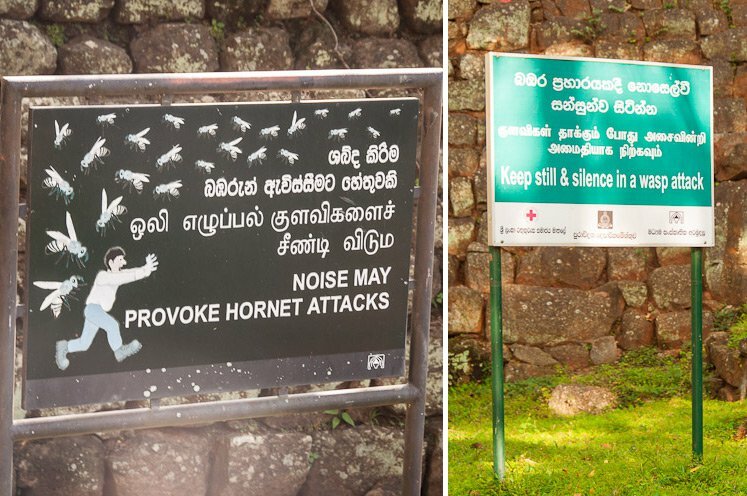 I doubt that I will be able to keep still and quiet if a swarm of hornets attack me! Help! Great view all the way up, and the path is pretty airy some places. Halfway up the rock is a cave full of beautiful and impressive paintings of naked women, believed to be either Apsaras (celestial nymphs) or King Kassapa`s concubines. Hmm….. The modern theory is though that the female forms represent Tara – one of the most important figures in Tantric Buddhism. 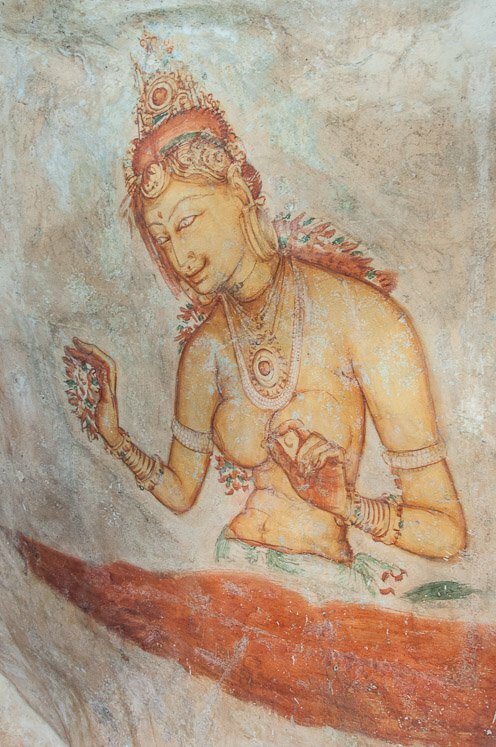 The archeologists don’t know the exact date of the impressive paintings, but they claim it is unlikely that they date as far back as to King Kassapa`s time the 5th century. So it`s probably not his concubines after all….though he probably had plenty of them…..
What is so remarkable about the paintings, is their colour and brightness. It`s incredible that they are in such a good condition. It`s as their colour is glowing! We met quite a few tourists on our way up, but it was never too crowded, and the mood was great. Everybody wanted to photograph the paintings of course, but flash is not allowed inside the cave. Pretty steep and a little scary on the way up. Buddhist monks on their way down. 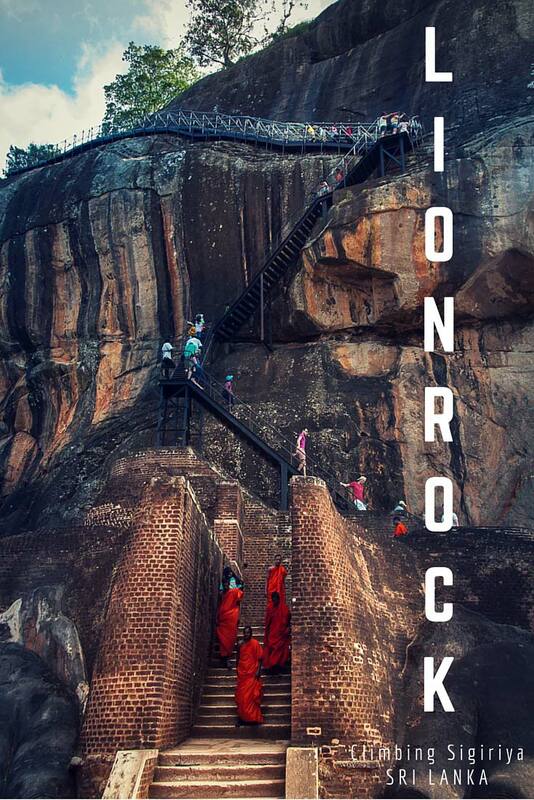 Towards the top, after passing the paintings, the pathway leads to a large platform from which the rock got its name – Lion Rock. 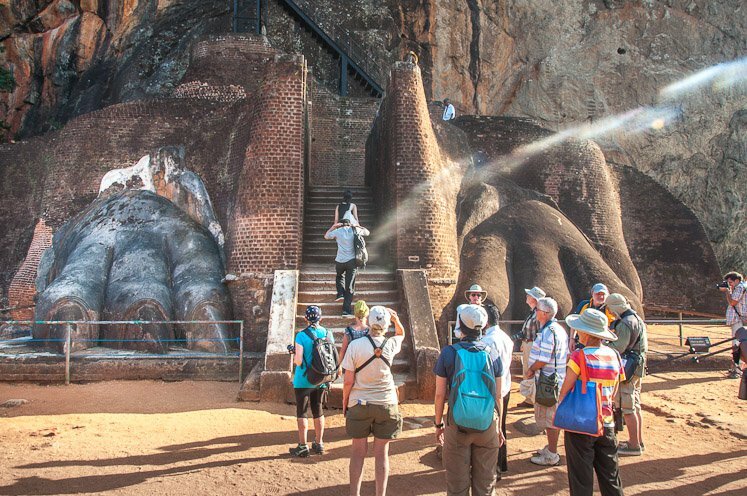 These two huge lion`s paws were at one time connected to a gigantic brick lion, with the stairs to the final ascent to the top leading between the lion`s paws and into its mouth. Pretty cool! The lion was supposed to remind people who Buddha was Sakya-Simha – Lion of the Sakya Clan, and what he spoke of was as powerful as the sound of a lion`s roar. The lion was supposed to remind people who Buddha was Sakya-Simha – Lion of the Sakya Clan, and what he spoke of was as powerful as the sound of a lion`s roar. Unfortunately the lion itself is gone, only the first steps and the paws are left, but the stairs are still pretty impressive to climb! And finally we were at the top of the Lion Rock! And what a view!! Yiihaaaa! The terrace at the top covers 16 km², and at one time it was covered with buildings of which sadly only the foundations remain today. It is easy to imagine that King Kassapa had his big palace up here once, as the legend says, even though the archaeologists say that it is no evidence of a palace-like structure anywhere on the summit. They say it`s more likely that the place was used for meditation. But it`s so much cooler to picture an enormous palace with gold and jewels being up here once upon a time! The kings swimming pool? Or maybe these ponds were just for water storage as the archeologists claim? Ah, but that theory is really boring! On top there is even a smooth stone slab that looks just like a king`s throne, although it was probably just another meditation spot. 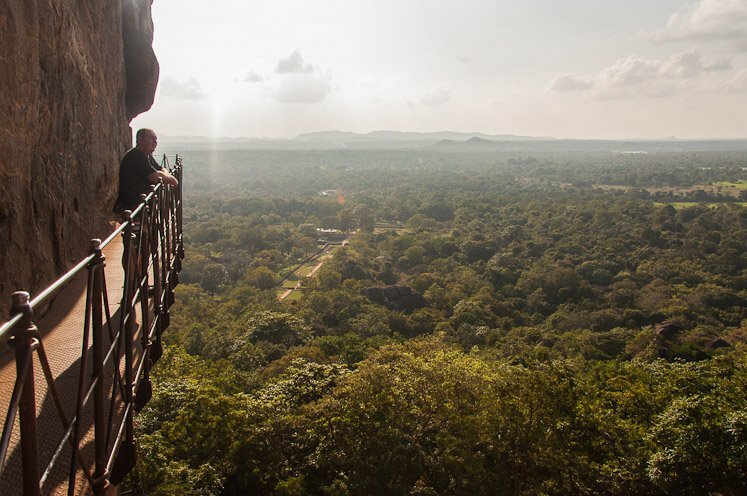 Even though it is the perfect spot to sit and gaze far away over the jungle and breathe in the fresh jungle air, just as King Kassapa (or Buddhist monks) probably did 1500 years ago! We met this cutie on the top of the Lion Rock. 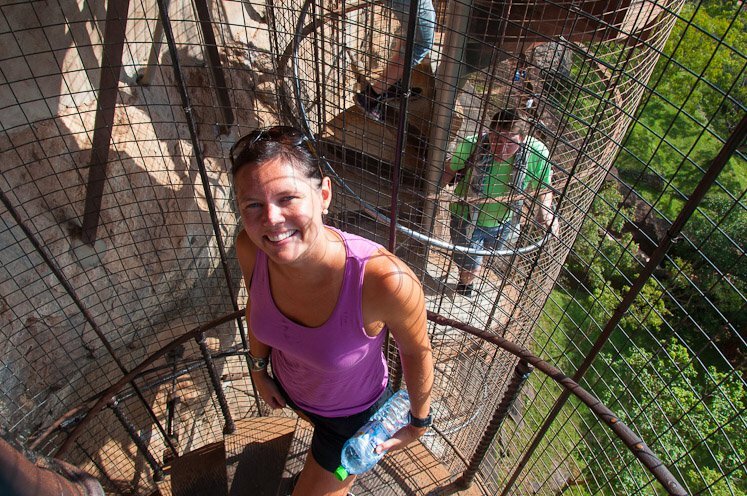 The monkeys were everywhere, so maybe they should rename the rock Monkey Rock now that the lion is gone?! On our way from the Lion Rock we even met a wild elephant in the jungle! It looks so relaxed hanging around, eating with the cows. Love it, and what a great ending of our journey to the Lion Rock! If you have any questions, don`t hesitate to contact us on the blog or [email protected]. Just been reading through all of your fantastic blogs as we are off to Sri Lanka over Xmas this year. We start off in Colombo and then head up to Kandy for 2 nights as we want to do the train journey from there to Ella. We were going to miss out the rock but I keep being told we HAVE to do it. We are therefore planning to get a taxi from Kandy to the rock and back in a day. I have heard that it is good to get there really early to avoid the crowds and the heat. What time did you get there? Did you get a taxi from Kandy? Any help much appreciated. Many thanks. 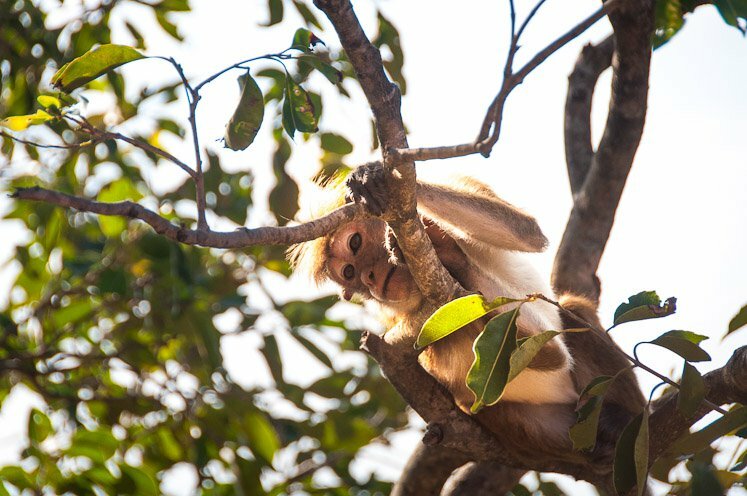 Ah, lucky you who are going to Sri Lanka in January, you will love it! We climbed the Lion Rock in the afternoon. It was quite warm, but not that crowded. Bring water. Yes, we took a taxi from Kandy to Sigiriya (Lion Rock) on our way to Polonnaruwa. The taxi drive took about 2,5 hour from Kandy. Our taxi driver waited in the car park/ restaurant area while we climbed the stairs to the top of Lion Rock. We did not plan to go to the rock either, but were talked into going there by other travelers that we met in Sri Lanka. We did not regret it. It was definitely one of our highlights from Sri Lanka, so will highly recommend it if you have the time. Love your guide and have found it very helpful in planning our trip. We are planning on doing the same trip in the next couple of weeks. Thank you so much! 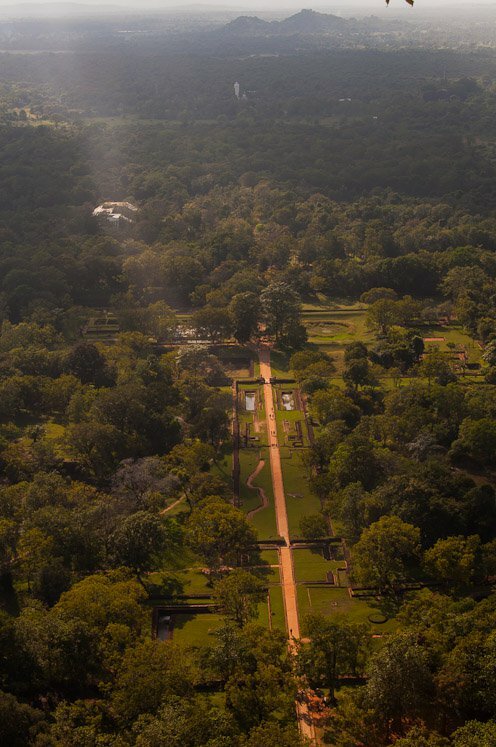 Hmm, sorry, I don´t remember exactly how much we paid for the drive from Kandy to Sigiriya and back again. But last year we had a driver driving us (four people) around Sri Lanka for ten days. We paid him around us$100 per day, depending on how long the day/drive was. The drive from Kandy to Sigiriya takes about three hours one way, and the driver will wait for you to climb the Sigiriya Rock. 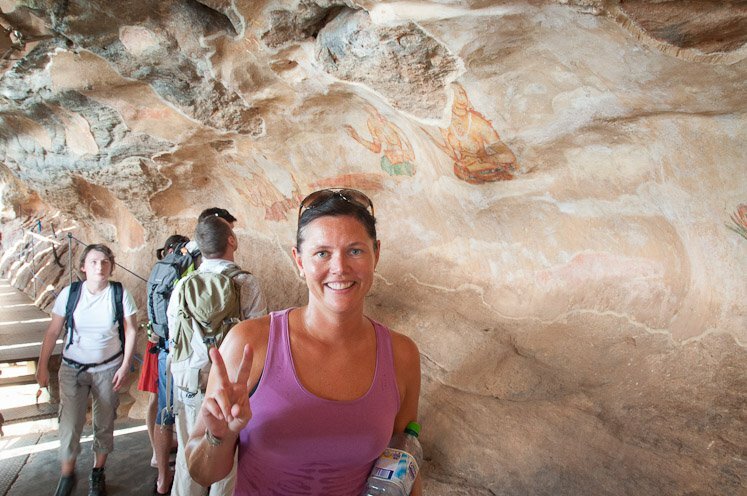 And maybe you want to see the Dambulla Cave Temple along the way (it is very common), so the whole trip will probably take a day. So maybe around US$ 100 in total? 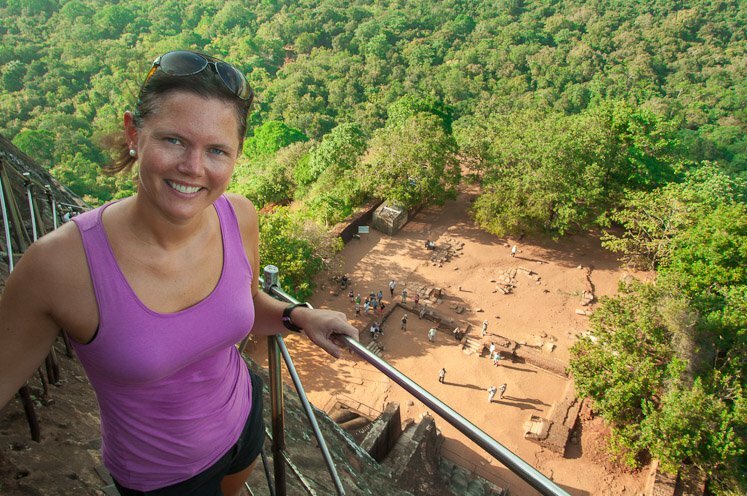 Have a great trip to Sigiriya! It is a great place! Hi Maria, thanks for your awesome blog. So much useful information. I’m a solo traveler was thinking to hire a driver to travel in this cultural triangle. Just wondering is it safe to so just by myself with a private driver? Thank you so much! Sri Lanka is a safe country for women and it is safe to hire a private driver even if you are a woman traveling solo. I’ll Be going there in November. Hope I can make it to the top! Great to hear, Sandra! Good luck with climbing the Lion Rock, I`m sure you will make it to the top! Just remember to bring water and good shoes/ sandals as there are a lot of steps to walk. 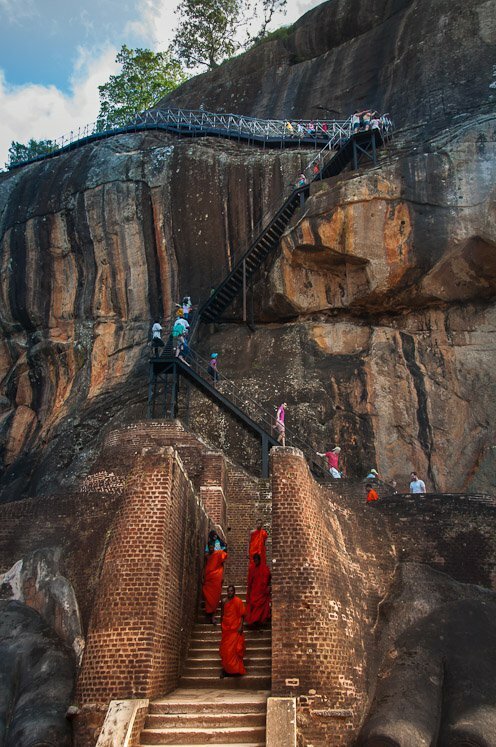 Hi Maria, we are hoping to get to Sri Lanka in January, I am desperately scared of heights and at some places in your photos, that path looks just sort of clipped to the side of the rock,,,, is it safe??? It is safe and there are proper stairs all the way up. But it is airy and the stairs are as you say clipped to the side of the rock. So if you are extremely scared of heights, you may find it scary to walk this rock. But, of course, you can try and just turn around and walk back down it gets too scary. 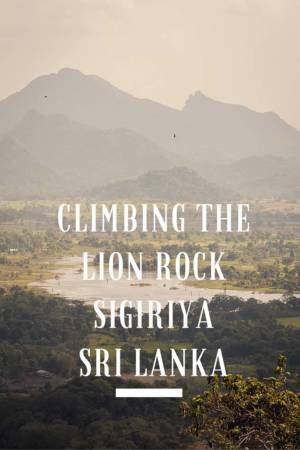 This is a great article and pics about sigiriya. 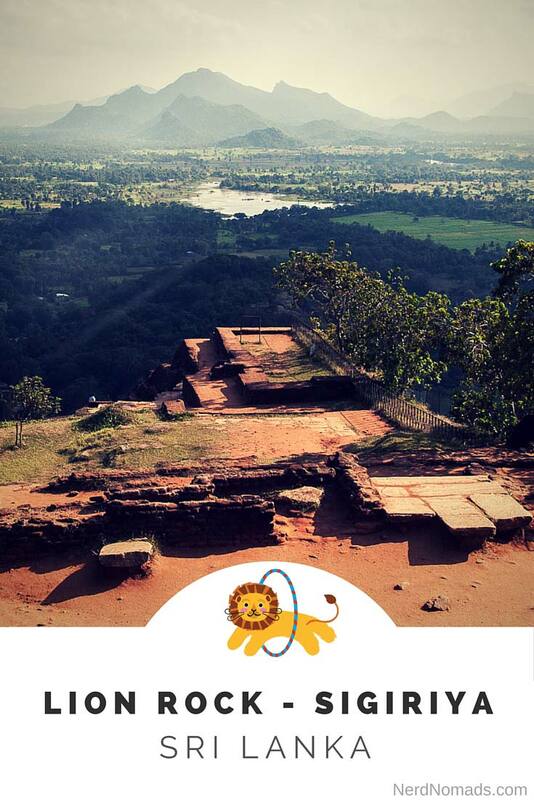 Sigiriya is truly awesome place to visit. I’m much intrested to visit this cool place. Thank you so much! 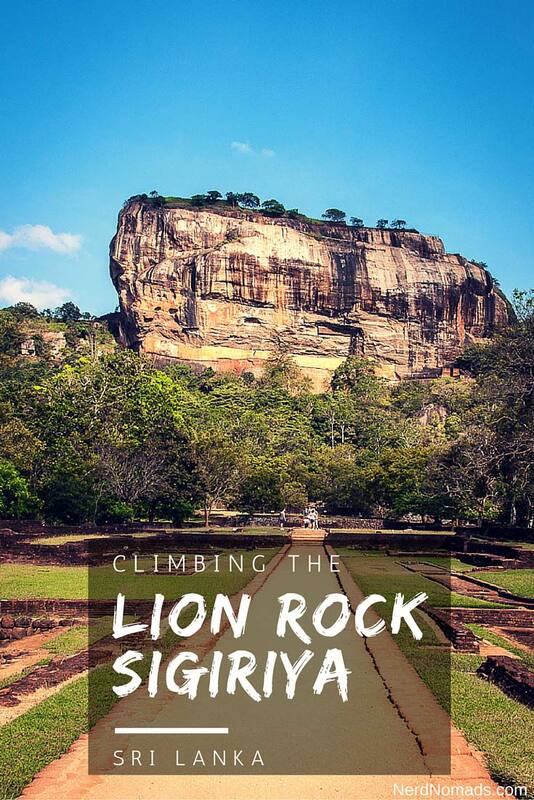 Sigiriya is great with a very interesting story about the king who once lived on top of the rock. The view from the top is amazing! Well worth the walk up the stairs. Enjoying reading all about Sri Lanka, and suggested places to go. 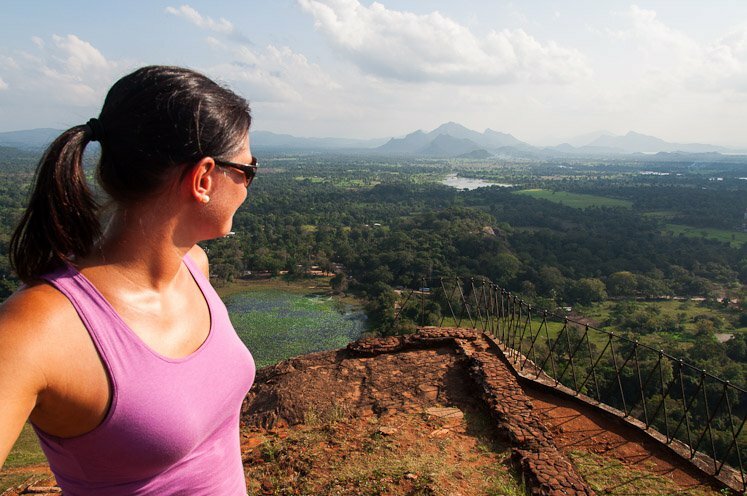 Has anyone been to Sigiriya in November? 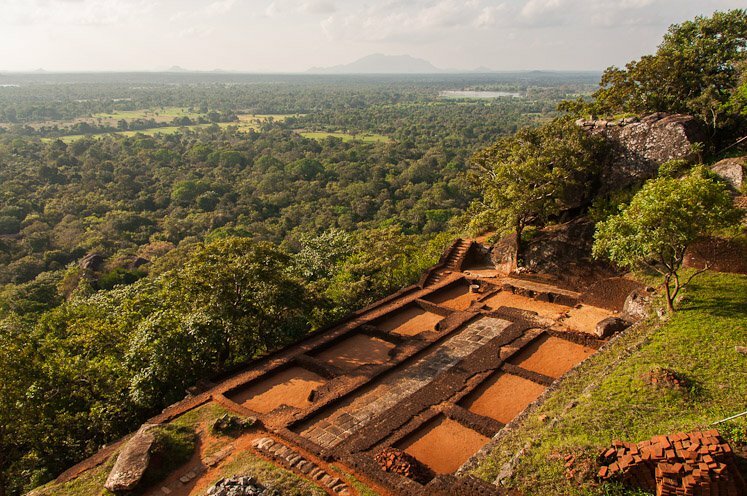 I believe the East Coast has the monsoon then, is Sigiriya effected ? 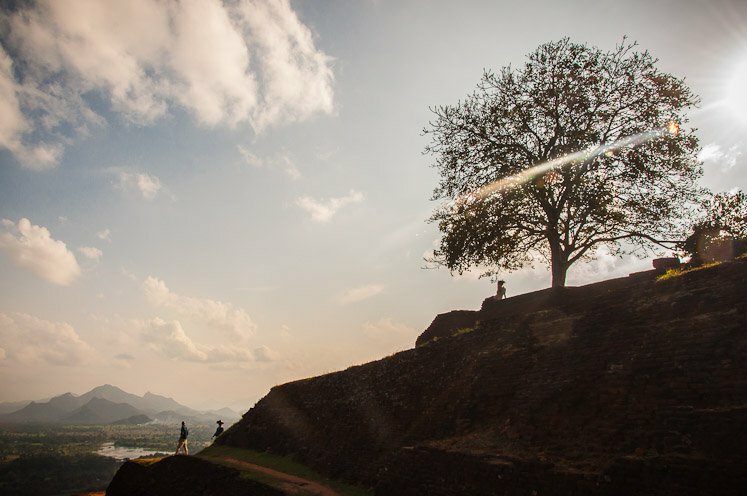 The Maha monsoon season, which is normally from October until January, brings rain to the East, North and the Ancient Cities of Sri Lanka including Sigiriya. 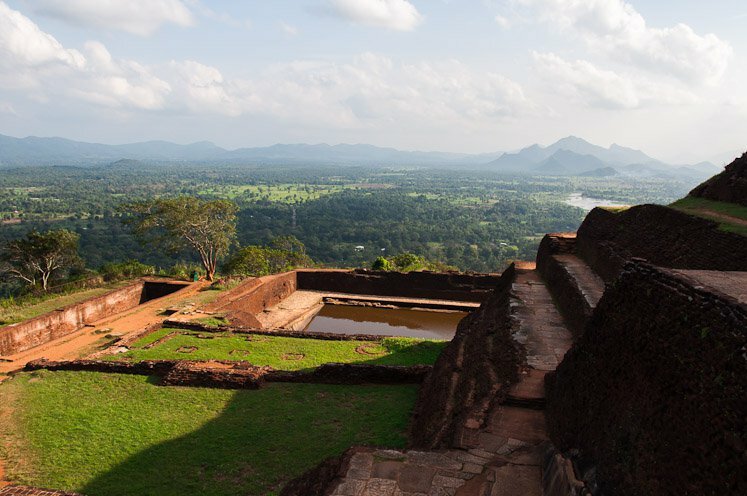 So yes, it might be some rain in Sigiriya in November. But normally it does not rain every day or the entire day, only heavy rain in a short amount of time. There are also cloudy and partly sunny days in between. Your review and trip are amazing !! …i am preparing myself for Sri lanka one day. Thank you so much! 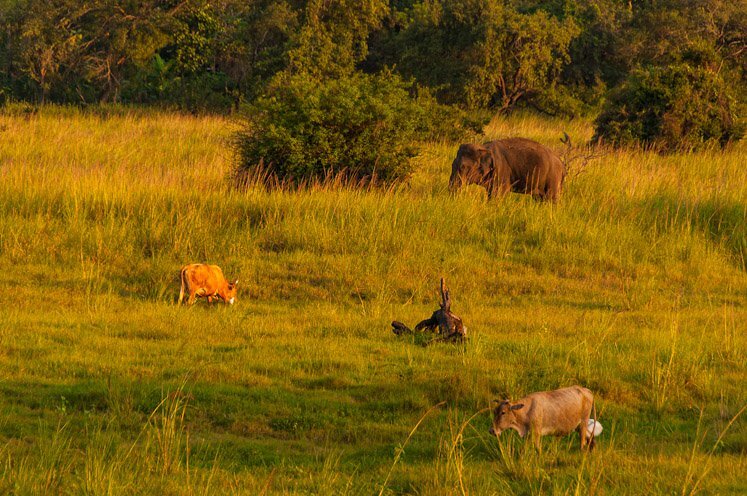 Sri Lanka is a fantastic country, you will love it! this has been a great guide for me as soon il be travelling to Sri Lanka. Can i ask though, if you were travelling to places for the day and moving on, where did you keep your bags? or did you hire a car? We hired a driver/car so we had our bags in the car while we went exploring places on day-trips. Have a great trip to fantastic Sri Lanka! 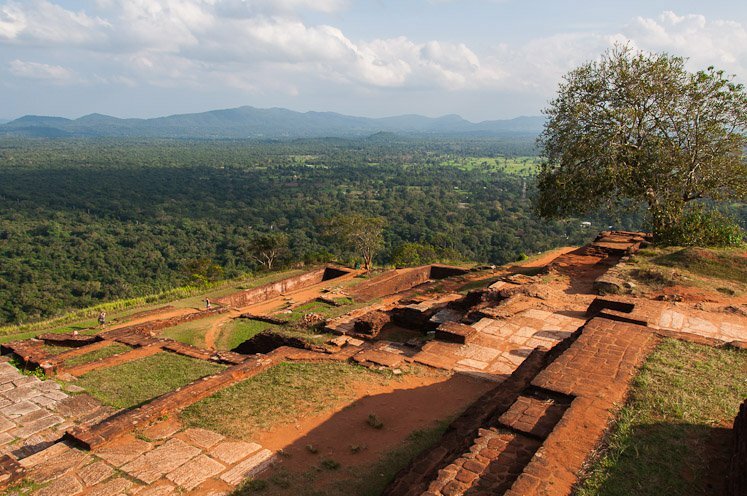 Duran Duran released the single “Save a Prayer” in 1982, and the video is filmed at Sigiriya. The entire video is filmed in Sri Lanka, showing the beaches, elephants, local kids and the ancient city Polonnaruwa. Many of the events in the science-fiction novel “The Fountains of Paradise” by Arthur C. Clarke is apparently from Sigiriya. Although Clarke changed the name to Yakkagala (“Demon Rock”) in the book.